New Vlad book! Which you’ll know if you’re a long time reader here is kind of a big deal. You’ll also know that the series is coming towards an end, which explains why I can say very little. Basically, Vlad Taltos is an assassin, he’s made powerful enemies and powerful friends, and this particular book is more about the latter than the former. 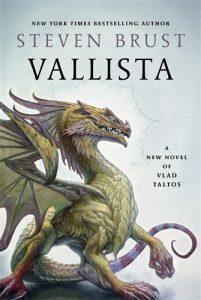 Worth knowing: Vallista has straight answers to a number of longstanding questions about the nature of reality (which is one of the ways you can tell the end is near). Also worth knowing (perhaps the only other relevant thing to know): Brust’s tenure as the only author I’ve read with no disappointing books continues unabated. In addition to the reliable storyline and voice of this series, I was especially amused by the chapter titles. But mostly, I continue to love everything about this character. Somewhere between three to five books left, if I understand what’s going on correctly. This entry was posted in Words and tagged fantasy, Vlad Taltos on December 30, 2017 by Chris. I’ve seen The Last Jedi twice now. There’s been a lot of hoopla, you know? People complaining about things that are debatable matters of taste, people complaining about the politics of the movie that are not really debatable: to the extent that they are not simply injecting their own politics instead by complaining, their politics are wrong and the movie’s are right, so that’s how I feel about that. But all of that is stuff I can’t go into, because I presume that people care about spoilers, not only now even though it’s nearly two weeks past release, but even for posterity. I will say that I liked it quite a lot, have virtually no complaints, and have a lot of praise. 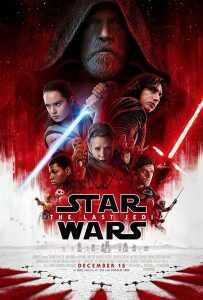 Was it the best Star Wars movie? Man, how can I even judge something like that after watching it twice, when the first three are so fundamentally entwined into my childhood. But seriously, it might be. It was absolutely the most emotional, emotion-driven of the films, and I do not say that due to foreknowledge of Carrie Fisher’s recent death. Although that knowledge certainly adds an extra gut punch beyond what the movie had already accomplished. I guess I’m saying these things: 1) if you’ve ever gone to see a star war, and you somehow haven’t gone to see this one yet, you really ought to. 2) It rewards multiple viewings. This entry was posted in Film and tagged fantasy, Star Wars on December 26, 2017 by Chris. 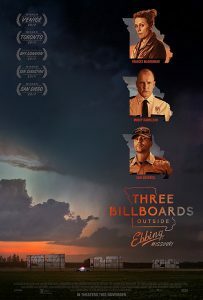 Monday was random movie night, and the random movie I ended up seeing was Three Billboards outside Ebbing, Missouri , which is about, well, honestly the title is not wrong, you know? You see, some amount of time has passed since Frances McDormand’s daughter was killed, and she is unhappy with the speed of justice, so she takes matters into her own hands via the powers of advertising! It is my understanding that this movie is not being well received in the liberal community because it is making heroes out of really terrible people. I don’t think that’s right at all, though. It is a movie about people who either are outright terrible, or are deeply flawed but recognizably trying to do right, or are too consumed with their own problems to remember to care about anyone else. (Or, at best, they are the people being hurt by the three people I just described.) So, right, it is a movie about those people, and their attempts to do the right thing. I’m assuming that’s what is disliked, that they are clearly trying to do the right thing. That is a little too shades of grey in a political climate where we would prefer everything be as cartoonish as it is in the news right now. I have two reactions to that: 1) People in real life mostly are not cartoonish, despite the implausible reality of the current news cycle. 2) If someone is trying to do the right thing, that does not mean they’ve been given a redemption arc. Even if you accomplish doing the right thing, which is not guaranteed, one right does not make up for years of wrongs. Sometimes years of right don’t. Anyway, I’ve gotten very far afield of what this review should have been, which is why I hate so much that I’ve gotten bad at writing reviews before I see other responses to a movie (or really anything else I review) before I’ve formed my own. I don’t like responding to responses instead of to the thing itself, because it always ends up dumb, like this did. I would mostly not recommend the movie, although it is at times extremely funny, because it’s also extremely dark, and mostly people know better than I do if they would like that. But if you would, you probably will. This entry was posted in Film and tagged black comedy, drama on December 16, 2017 by Chris. Remember that time when people were in danger from zombies instead of each other? I mean, you don’t, because that was like 15 books ago, and nobody but me has read anywhere near that far in the Walking Dead. The good news is, if you jumped back into the series with A Certain Doom, it would feel like you’d never left? A herd of like a million zombies will make them dangerous again, yeah. I can’t say a lot, as usual, but I’ll say these two things. One, another point where the series probably should have ended has been reached. Two, I do appreciate the ongoing attempts to redeem a character who is entirely irredeemable. Like, sometimes you can do things so terrible that it doesn’t matter how hard you try for the rest of your life. Except, the fact that you never stop trying maybe counts for something towards your memory? I don’t know how this works, but I’m a big believer in redemption, so a situation like this is uncharted territory for me. 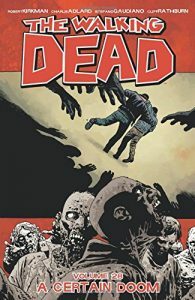 This entry was posted in Words and tagged graphic novel, horror on December 7, 2017 by Chris.